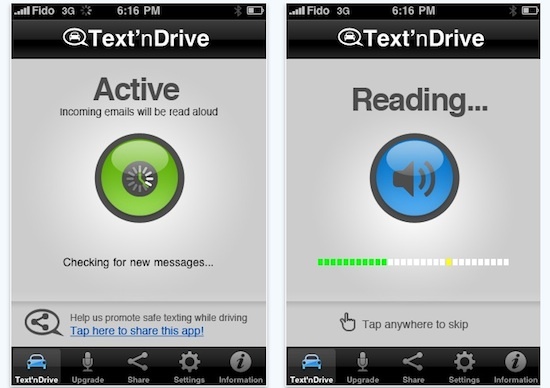 Text’n’Drive actually works to read out and send new emails, not SMSes–which one may think are the little communication snippets that most tempt drivers to interact with–but still, the principle is sound, and the app will probably appeal to business types who frequently find themselves whizzing down life’s freeways with an urgent email to send or receive. The idea is simplicity itself: Incoming emails get read aloud to you using a synthetic voice, sender’s name, message subject, and all. Outgoing emails are made as a plain old audio recording of your voice which then gets sent through the email provider of your choice, and the system is smart enough to not require much interaction from you–it even detects when you’re done speaking and then auto-forwards the email with the attached voice message (which may then surprise some of your contacts who listen to the email on their office PC with the volume unwittingly too loud … but the principle is sound). Simple, $20, and the company behind it promises that there’s a version on the way that’ll even let you send and receive SMSs too. But the app got us thinking. There’s an increasing conflict between the daily world where all of us are more and more used to staying in communication 24-7-365 and even minute-by-minute, and the world of driving where anything that grabs your attention away from the task of maneuvering a car along a road is seen as dangerous. So dangerous that there are moves to legislate about using your GPS, texting while driving and so on–will using your phone at all actually become illegal in some places (and here’s where we look at you, supposedly fun-loving California)? Meanwhile car entertainment/information/navigation systems are getting ever smarter, with all sorts of safety implications of their own. Will the battle between built-in car systems, and third-party smartphone driving aids like Text’n’Drive become a big-money battleground?